The Unfiltered view should ideally be the view you have now that has all of the historical data and it should be left as untouched as possible throughout the account history. This is also the view we can use to see if our own tracking is working if you have Google Analytics set up to filter your IP address (remember, once an IP exclusion is in effect, you can’t see realtime traffic for testing!). Our new Filtered view is where we add things such as IP filters, Google Analytics spam bot exclusions, and is the day-to-day view used primarily. You will likely want to copy any Goals or other settings to your new filtered profile if any exist on your former or Unfiltered view. Testing View – Isn’t That A Third View? If you modify your Analytics a lot, you may find calue in a third view called Testing in which you can test your filters or goals before promoting those to your final “filtered” view. 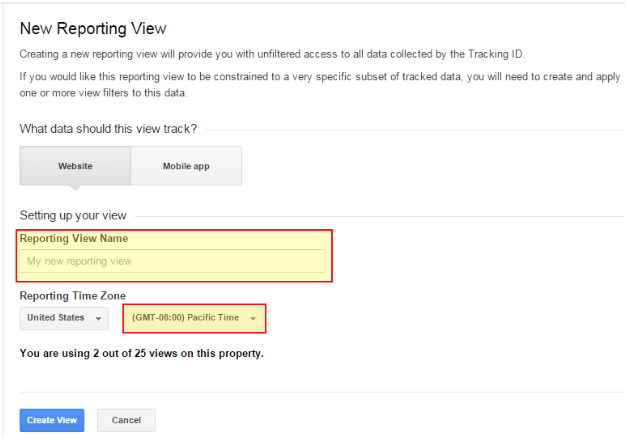 The reason for a testing view is because most changes can modify or exclude data, and if you somehow damage your Analytics setup, you will permanently lose data (because you cannot go back and reclaim lost Analytics data). Don’t take the chance of damaging your Analytics, and consider if a third testing view if needed. In your Analytics Account, click on “Admin” to get into the Analytics admin area. Once you have your desired Property selected, click the “View” dropdown to create a new view. You’ll want to give your new view a name, and also set the desired timezone. Lastly, you may desire to copy over any goals, filters, or customizations from one view to your new view, depending on the intent of the view. Views are the most interfaced portion of Google Analytics, and having different views can give you different insights into traffic, especially for things such as excluding traffic and configuring goals. With up to 25 views per property, it’s likely you have a number of views available to customize.